Springtime means BRING ON THE COLORS! If colors scare you, don’t worry. Gotcha covered! 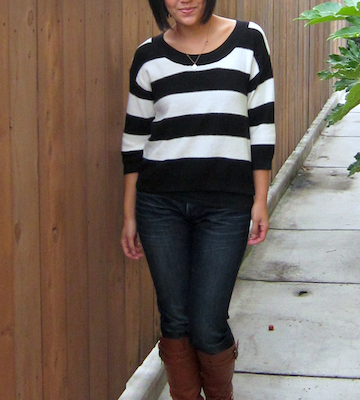 Over the next few weeks, I’m going to share 3 FOOL PROOF ways to add color to outfits. You won’t have to know anything about color theory or which colors go together. This is like How to Add Color 101, where I’m breaking it down with the easiest, most fool proof style formulas! 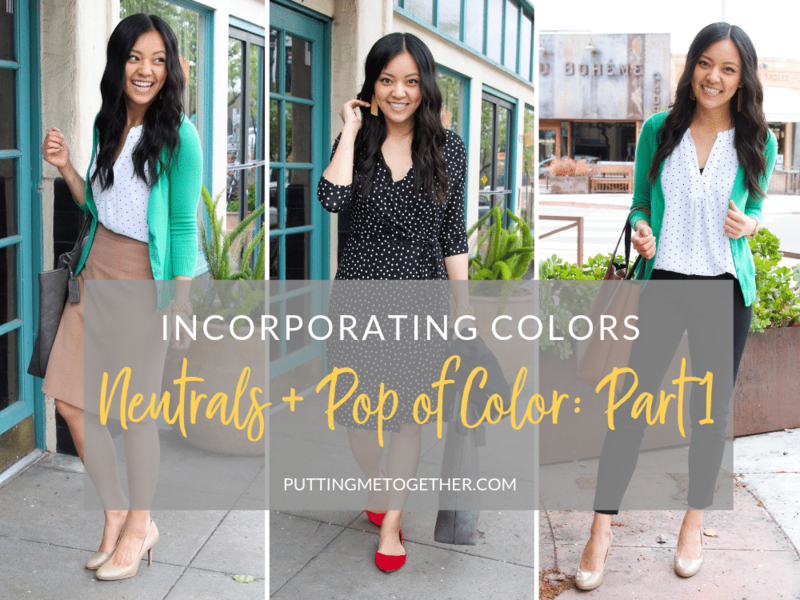 For Part 1, let’s start with this formula: neutrals + pop of color. 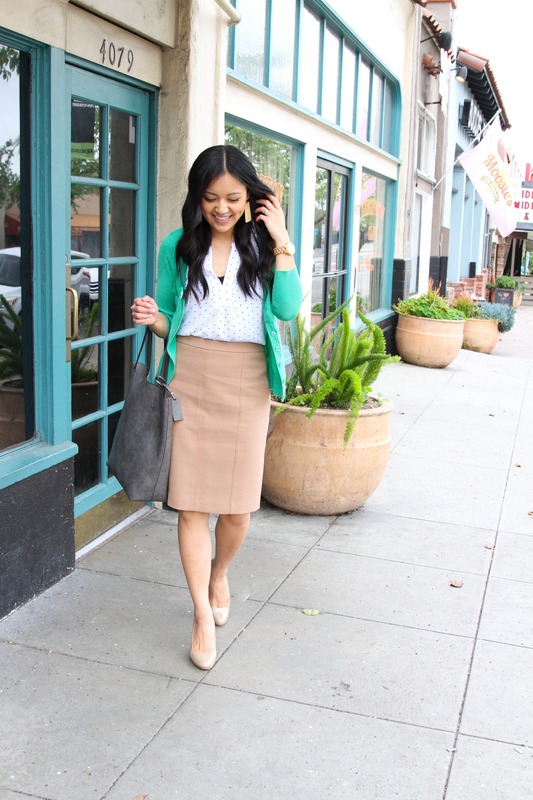 Wear an outfit full of all neutrals, then add ONE color somewhere to make it pop. This could be on a small scale, like colored shoes, earrings, a necklace, or a belt. Or it could be one piece of colorful clothing, like a colorful skirt, cardigan, or top. Let’s see examples below! 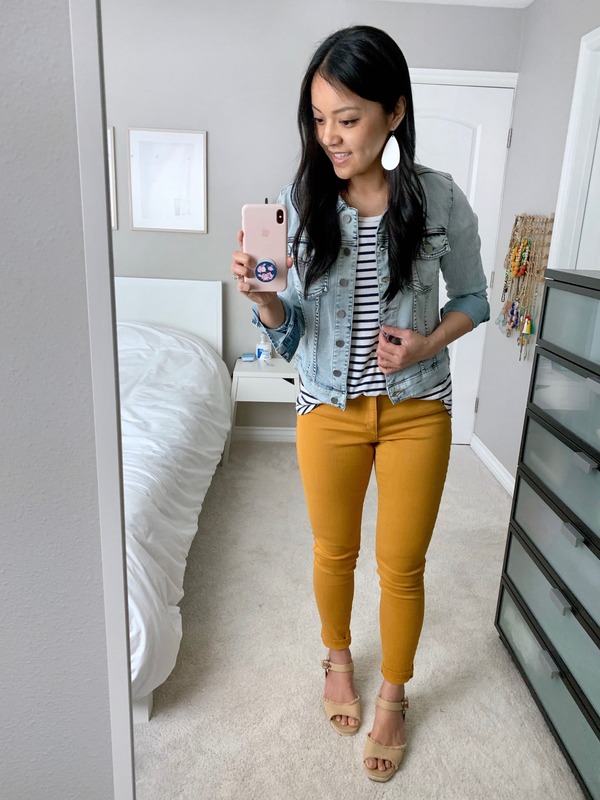 I recently showed this outfit in the post Three Go-To Business Casual Outfit Formulas, and I’m showing it again here because it’s a great example of our neutrals + pop of color formula. 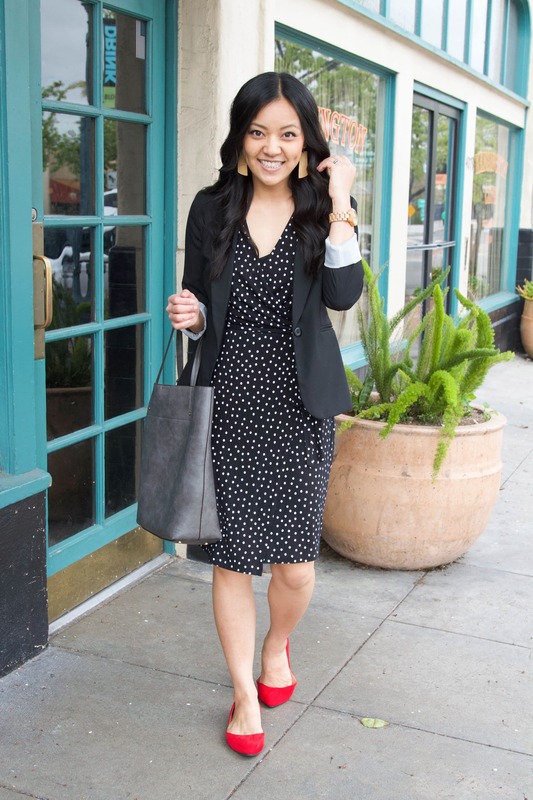 One of my favorite ways to add a pop of color to my outfits is with colored shoes! You could totally wear this outfit with black shoes, but why do that when you can make it POP with fun red flats? 😁 Seriously, colored shoes–one of my favorite accessories in the spring! You all know I’ve been loving these flats from Amazon. I wear my yellow ones the most, which should be no shock to any of you given how much I love wearing yellow. 😀 But a red pair is super versatile too, and you can see some other ways I’ve worn red flats over the years HERE. BTW, this dress is that super comfy one I talked about in my recent Reviews Under $30 post. Soft and stretchy “pajama dress” (as I like to call them), that is also breastfeeding friendly with its cross-front! Here’s a second example of neutrals + a pop of color. Black pants, white and black polka dot top, and a fun colored cardigan! This works with ANY color cardigan. You could go with yellow, pink, bright red, aqua, cobalt blue, magenta–seriously anything. Like I said, this formula for adding colors is FOOL PROOF, friends! This cardigan comes in a billion colors, and it’s super soft with stretch and retains shape very, very well. I have it in way too many colors that I can’t even keep track anymore! Find them HERE. I wear size M.
Here’s another take on the previous outfit, changing black pants for a different neutral bottom, a tan skirt. I wanted to show you that the formula still works with any kind of neutral. Easy, right? This works with any colored jeans, like olive, maroon, cobalt blue, white, black, or red. It also works with any colored skirt. 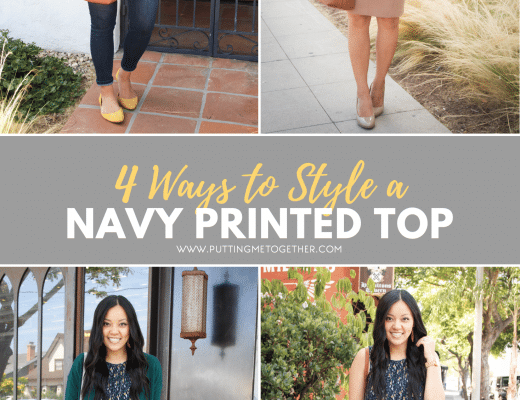 Such an easy outfit formula! See? This formula of neutrals + a pop of color is fool proof! Either start with your outfit of all neutrals and find one place to add a pop of color. Or, go backwards and start with one colorful piece and just make sure you choose neutrals for the rest of your pieces. Such an easy way to add color to your outfits spring! Stay tuned for Part 2 of How to Add Colors! 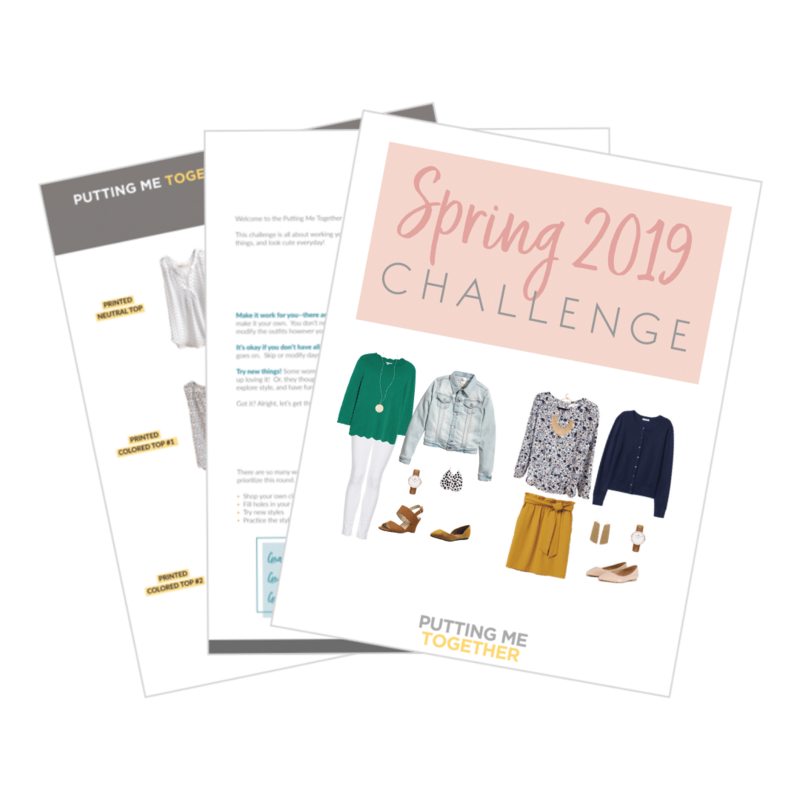 Join the PMT Spring 2019 Challenge! Pssst, remember the PMT Spring 2019 Challenge starts on Monday, April 1st! If you’ve been thinking of joining, sign up soon! Read all about it and see the capsule wardrobe we’ll be using for it HERE.